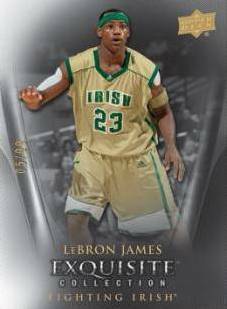 2011-12 Upper Deck Exquisite Basketball sees the return of one of the most popular high-end hardcourt brands. A fully licensed college product, every box delivers five autographs. 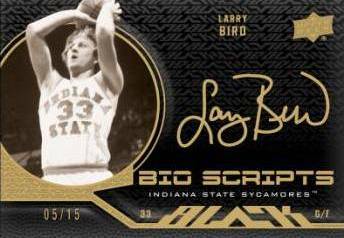 New Championship Bling cards highlight basketball legends who helped lead their college squads to titles. Design horizontally, the cards have a championship ring taking up much of the front with a player photo to the side. A dark color motif provides a backdrop for gold signatures. Signers include Michael Jordan, LeBron James, David Robinson, Bill Russell and Magic Johnson. 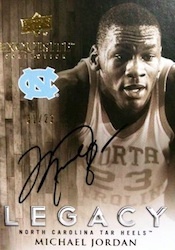 Upper Deck has promised a Michael Jordan autograph in every three-box case. Shop for 2011-12 Upper Deck Exquisite Michael Jordan cards. Popular in 2011 Upper Deck Exquisite Football, Dimensions cards make the jump to the hoop. Similar to Shadow Box cards, they use layers to create a three-dimensional effect. All regular base cards are numbered to 99. 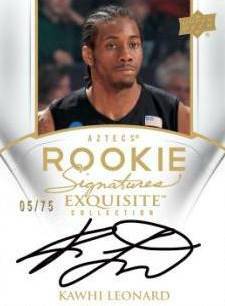 Exquisite Rookie Signatures are also part of the base set. Each offers autographs from some of the game's prospects. All are numbered to 199 or less and complimented by parallels numbered to 25. Single, Dual, Triple and Quad Endorsements Autographs bring together multiple greats with low serial-numbered print runs. Taking that a step further are 18 different Exquisite 12 autograph book cards that offer up a dozen signatures. Each is a one-of-one. 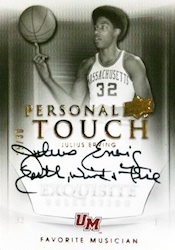 Exquisite Personal Touch cards come with inscriptions that let collectors get to know some of the game's legends a little better. These cards have players answer some basic questions like their favorite food, music, car and dream date. Each versions is numbered to 30. At least one of the autographs in each box carries the UD Black brand. 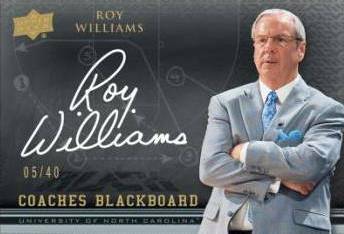 Inserts include Coaches Blackboard, highlighting hoops leaders and play callers, Bio-Scripts and Autographed Patch Cards. David Robinson Hakeem Olajuwon 2011-12 UD Exquisite Endorsements Duel Auto 6 20!